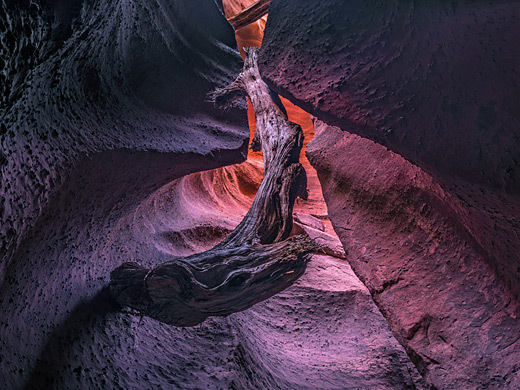 Spooky Gulch is indeed a dark and mysterious place, containing about half a mile of serpentine, narrow passages where it is often only possible to see a few feet ahead, as the canyon twists and turns through many 180 degree bends. The colors and forms of the cross-bedded Navajo sandstone are very beautiful, and the walls have an unusual knobbly texture (similar to other Escalante slots like Egypt 3), which adds to the eerie nature of the canyon. Spooky is quite popular, and in summer there will usually be one or two other groups in or around the canyon. Fit hikers can explore all the narrows in about 20 minutes but much longer could be spent taking photographs and enjoying the haunting ambience. The narrows begin a short distance down quite a large, sandy side canyon that joins Dry Fork of Coyote Gulch from the north, about 1/4 mile east of the usual entrance point. There is a short-cut over a sandbank just before the main canyon, marked by a cairn. 15 views of Spooky Gulch. TopoQuest topographic map of Spooky Gulch (the drainage north of 'Coyote'). 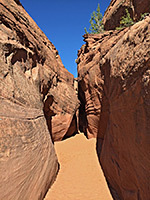 The floor of Spooky Gulch is sometimes sandy but often just bare rock, which narrows to a sharp point in some places and although a few pools may form during wet weather, the canyon is much drier than either Brimstone or Peekaboo, its neighbors to the east and west. When the cliffs close in, the gulch is deep and narrow from the start, with a few very straight channels at first then extremely winding thereafter - sharp bends, thin protruding fins of rock, small potholes and occasional boulders partially blocking the passageway. In some sections, sideways walking is required, and larger people may not be able to walk all the way through. Two places require more exertion; a 5 foot squeeze up a near vertical crevice then around a narrow corner at the top, and a climb over a pile of large boulders near the upper end of the canyon. The difficulty of this may change following new flooding, but usually it is easy to overcome by scrambling under one large rock and over another just beyond. 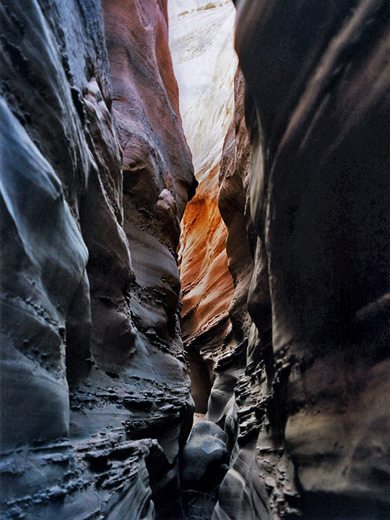 As with most slot canyons hereabouts, the gulch becomes shallow after a while and the slot gives way to a wide, open, sandy streamway which continues for several miles across gently sloping land towards a distant plateau, en route forming two other short slots; an alternative way to reach the narrows is by hiking downstream from the far north end of the wash, beginning from the Early Weed Bench trailhead which is reached from a side track that starts at mile 24 of the Hole-in-the-Rock road.